Thanks http://hijabiapprentice.blogspot.com/ :) Back atcha bewty! 1. Admit one thing you feel awful about (involving being a mom). Once you have written it down, you are no longer allowed to feel bad. Remember you are a good mom! 2. Remind yourself that you ARE a good mom, list 7 things you love about your kids, you love doing with your kids, or that your kids love about you. 3. 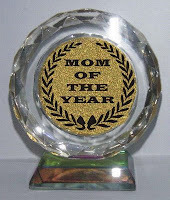 Send this to 5 other moms of the year that deserve a reminder that they too are the best moms that they can be. Remember to send them a note letting them know you have selected them, and also add a link to your post that directs people back to the person who nominated you! One thing I feel awful about: Working full-time. It is not a choice. Alhamdulillah I have a good career that is rewarding. We are saving to buy a home inshaAllah. We are also both working on our education, and also saving for iBaby's education. I know that in time, I will be able to slow down. When my little man looks at me with his big liquid brown eyes, it slays me to walk away. I don't know that writing this down will make me feel better, but it's worth a shot. Seven things I love about my son: This is tough, I have more than seven. I'll try to keep it brief. 1) the thighs, THE THIGHS! Oh they are sublime and chubby. engrossed in something (i.e. toy phone, stackable cups, etc...) and won't look at me. he knows he is going to have fun. if I am still there. 7)I adore shopping for him. I find joy in purchasing even the most mundane things like diapers, wipes, bath prodcuts, clothing and shoes. It helps me realize that together, my husband and I can provide everything he needs, through the grace and mercy of Allah swt. Overall, I love the joy and happiness he brings our families. He is loved infinitely, and cared for more than he will ever comprehend until inshallah he is father someday. I would like to tag HijabiApprentice & UmmSalihah but they have already been tagged. In addition, I will tag: http://americanmuslimawriter.blogspot.com/ and http://motherofabdu.blogspot.com/ ! BTW, email me privately. I have news about our dear friend that she has given me permission to share with you! Salaam sis, hope you are well. Firstly just wanted to thank you for your lovely message on my blog. I just read you latest post and for someone who is a soon to be mom it is so heart warming to read such sweet views of someone else.